Good drive-line angle on the U-joints. Clearly modified well. Win. 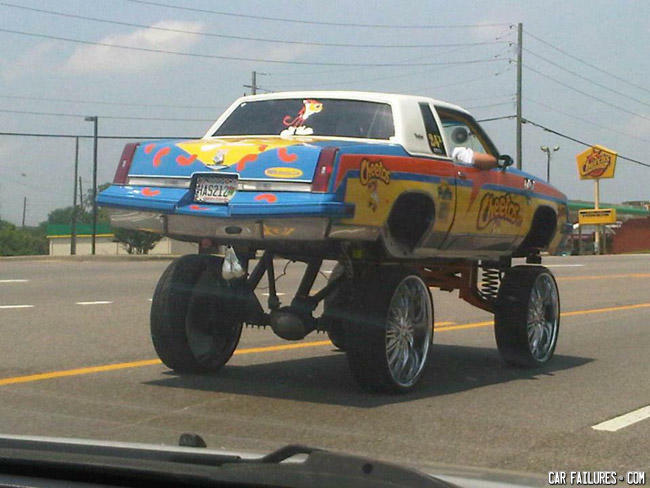 Also the addition of chrome truck-nutz is the perfect finishing touch Chester Cheeto would be proud to call his own ride. You have to appreciate the amount of promotional work it takes to sell little orange coloured duck turds. It's not easy, being cheesy. Hey, where's their friend with the Super Mario Car??? -Can I have your name? -Why? Don’t you already have one?